Something in us is waiting - for what, we don't know. Something different? Something better? For Christians, perhaps the deepest expression of what we're waiting for is found in the phrase 'eternal life'. But what is eternal life? Why do we want it? And how do we know if we have it? In Eternity Is Now in Session, bestselling author John Ortberg dispels the myth that eternal life is something way out in outer space that we can only hope to experience after we die - and that being saved is merely about meeting the minimal entrance requirements for getting into heaven. Instead, John unpacks the reality that the moment we trust Christ, we are initiated into 'eternal living' with God as a here and now reality, one that will continue beyond our life on this earth. Jesus defined eternal life just once, in John 17:3: " ... that they may know you, the only true God, and Jesus Christ whom you have sent." The kind of 'knowing God' that is eternal life is an interactive relationship, not just an affirmation of certain facts about God. Once we begin the transformative journey of truly knowing God, we can start to experience his presence, favour, and resurrection power right here on this earth - in the details, tasks, and challenges of daily, ordinary life. And as we begin to know God this way, we'll realise each moment of our lives is a vehicle to the eternity we've been longing for all along. 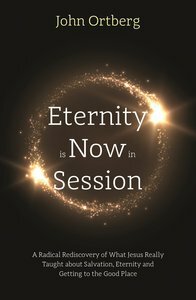 About "Eternity is Now in Session"
John Ortberg is a teaching pastor at Menlo Park Presbyterian Church in Menlo Park, California, and previously served as teaching pastor at Willow Creek Community Church. He is the best-selling author of Everybody's Normal Till You Get to Know Them, If You Want to Walk on Water, You've Got to Get Out of the Boat, Love Beyond Reason, and Old Testament Challenge. He has written for Christianity Today and is a frequent contributor to Leadership Journal. His most recent publications include When the Game is Over, God is Closer than you Think, and Overcoming Your Shadow Mission.